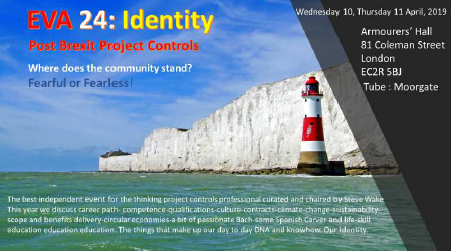 This year EVA will focus strongly on the Identity of Project Controls. The people doing the job. Really understanding what the job is about and proving that you can do it. There are too many ‘keyboard jockeys’. Too many people who know what each button does but don’t know why! This is a problem for those running projects as well as for those being asked to find and recruit people. They are asking the wrong questions or don’t have the relevant assessment tools at their disposal. unquestionable. That can only be gained from knowledge and above all know how. Experience. We need thinkers and doers. But in the one person. The project controls community exists. It still does not have a properly defined identity. There is no clear career path. No clear set of qualifications. No commonly agreed set of competencies covering all sectors. And now it is clear to me that only the community itself can fix that. Expecting non-practitioners. Our elders and betters. Those in power to know the answers is wrong. They don’t. Time to take control of our destinies our lives and of course our projects! The tribes need to be brought together. They all contribute in their own way to a larger perspective, a better understanding of what we need to do. The separations are becoming divisive and partisan. We cannot let that happen if we are to survive and thrive for ourselves and the greater public good. EVA is probably the only event where difference is not an issue. Where which Body of Knowledge or Method will force you in or out. As ever, EVA24 will be different, entertaining and informative. Dinner will be served in the Hall by candlelight. Additionally a pre-conference dinner will be available. Last year 40 very senior controls people came together for a networking dinner held at the Dorchester. It was a roaring success. And again a real expression of the Controls community. A room full of decision makers working on the major projects of the day. Attendees are middle to very senior professionals with interests in project management generally, project controls, earned value and wanting to learn more about wider issues of transformation, successful change and benefits-driven portfolios. They will also be very keen to set Project Controls onto a formal career path this year and are looking for like minds who will lobby for and champion this, as well as networking and business leads.